That's right! Cardstore.com is at it again. 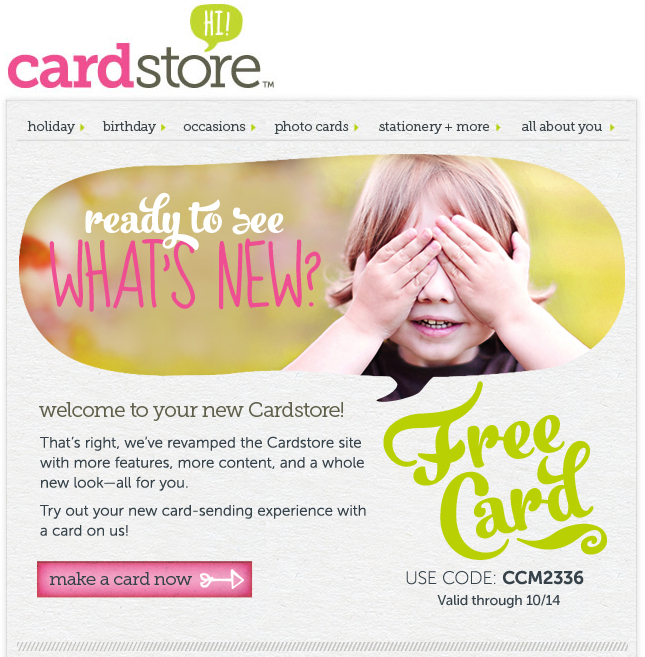 Get any card from their website FREE by using the promo code CCM2336. (Shipping is FREE, too!) There is bound to be someone you know with a birthday, anniversary or just because coming up! And even if there isn't, use this opportunity to stock up on some great cards. Offer is valid through 10/14/12. So easy and so cute! Thank you for sharing. This was a very fast transaction. I love the card selection too! Right?!? The selection is awesome! I am so glad it was such an easy transaction for you, Fun Favorites! Please check back soon for more fun giveaways!